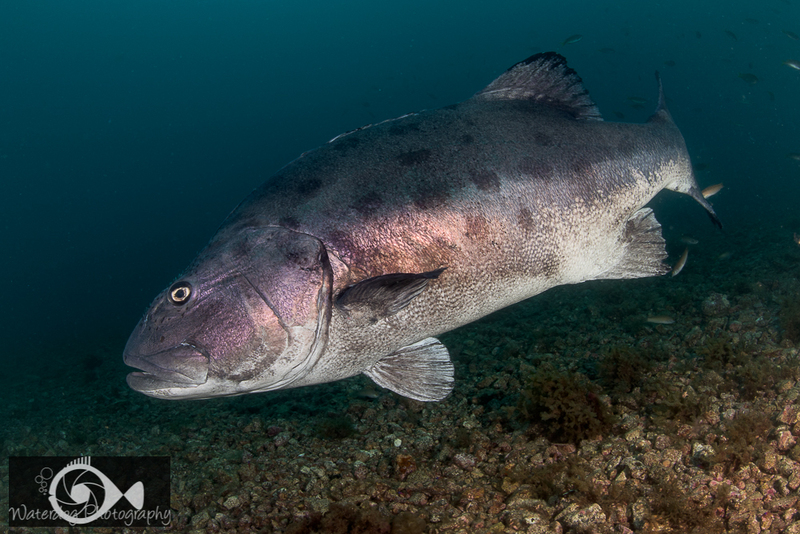 In the summertime, I always hope to see the Giant Black Sea Bass that swim along in the coastal waters of Southern California. The first time I saw one, I didn’t know how special the sighting was. I swam right up to it, snapped its picture with my point-and-shoot camera, and swam off looking for something else to photograph. It was four years before I saw one again. And that was from a distance. But last week I got a real treat. I was looking for the Giant fish in water that was a bit murky. I thought, “I’ll just go down by that rock and see if there is anything down there.” It turns out, the “rock” was a Giant Black Sea Bass. He didn’t seem to mind my presence, and let me snap around 50 images over 20 minutes before he moved in to deeper water. 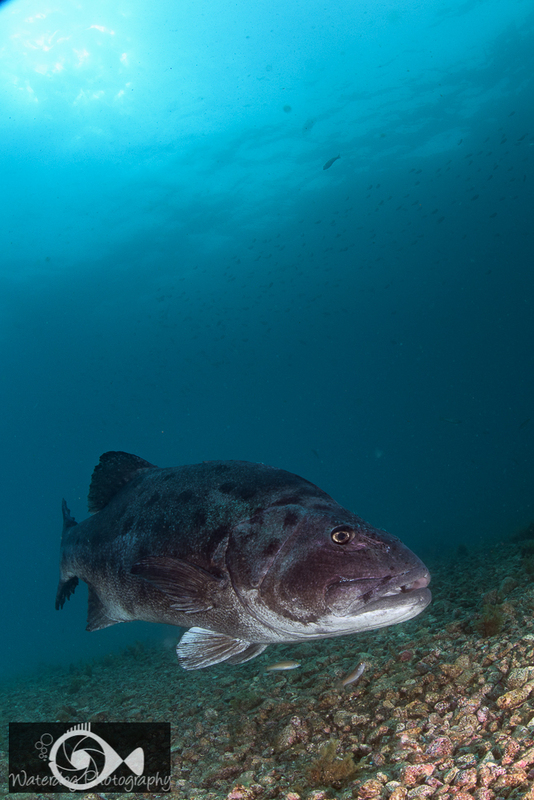 These fish can grow to be more than 7 feet long and up to 800 pounds. This one was around 6 feet and 200 pounds. They are so large that when fully grown, their only predator is the great white shark and humans. They were hunted by humans almost to extinction in Southern California waters, until they became a protected species in 1982. Now they seem to be on the rebound, but you have to keep your eyes open and have a good bit of luck to see one. When these fish are in their first year, they transform from a black fish to a bright orange fish looking little like a Giant Sea Bass at all. But as they mature, they take on the characteristic coloring with large spots that is seen in the images above. 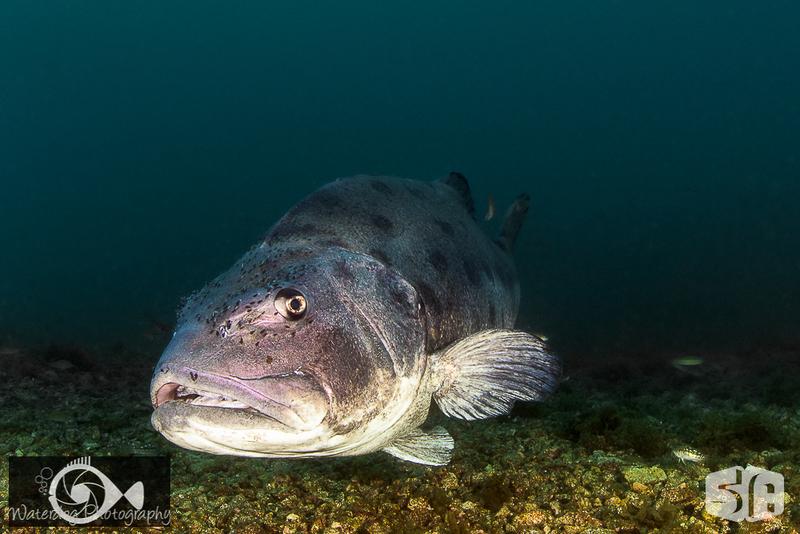 If you are scuba diving in Southern California in the summer months, a good place to see these fish is at Catalina Island, Santa Barbara Island or Anacapa Island. They are sometimes seen near shore as well. I love traveling and although I have been diving in the Caribbean several times, I could not resist the opportunity to return. This time, our destination was Playa del Carmen, Mexico. 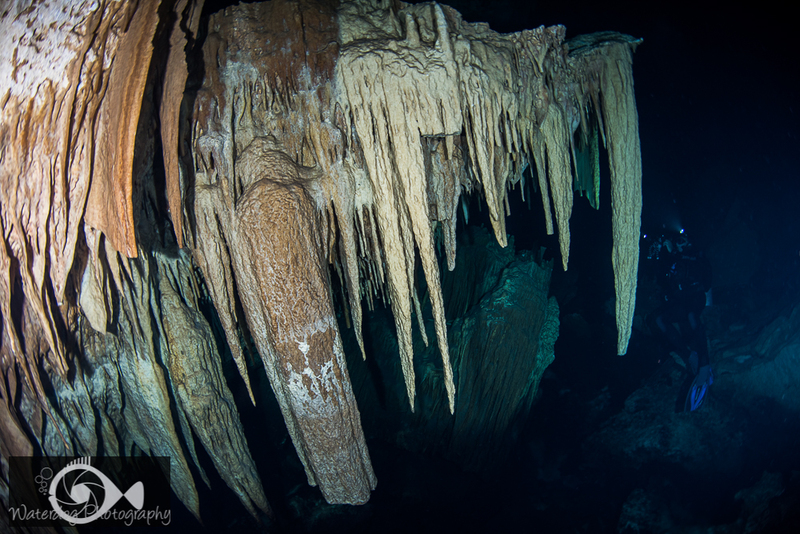 With plans to dive Cozumel, Playa del Carmen, the cenotes, and visit the whale sharks off Isla de la Mujeres, it should have been a week of fantastic photographic opportunities. Not so. We arrived late due to mechanical problems in our airplane, to a tropical storm that lasted for the next two days. We ventured in to the water after the storm only to find 5 knot currents and 15 ft. viz. Hmmm. What to do? 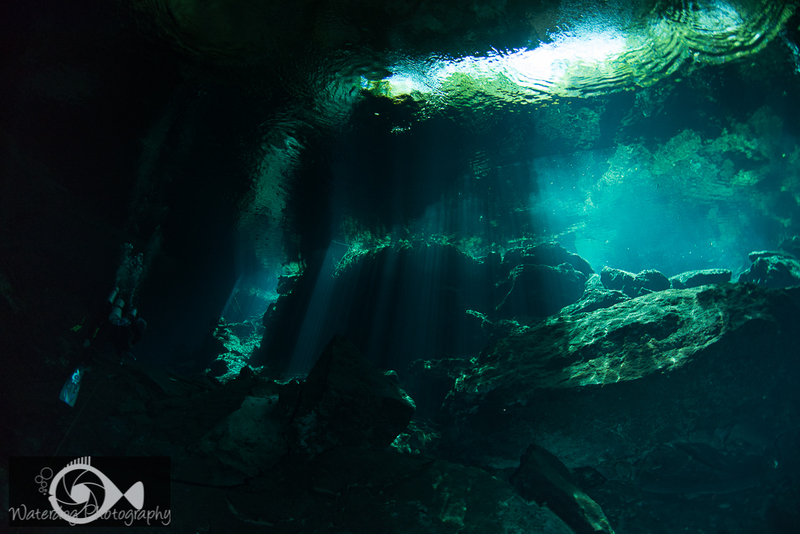 Well, we decided on a visit to Chac Mool, one of the beautiful cenotes which was not affected by the weather. 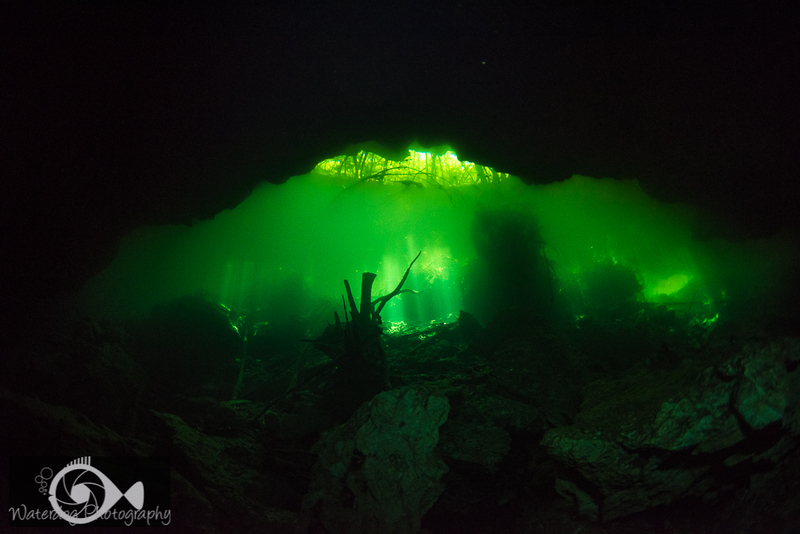 I was pleased with the beauty of the cenotes. They were just what I expected. The calm, cool water was beautiful when the light from the surface peaked through and cast beams of light down into the caverns. The water was fresh and clear and yet in just this one spot, the light coming through had an eerie green cast to it. The water there also had a distinct layer between the hazy salt water on the bottom, and the clear fresh water on top. I have heard that when the two layers have not been disturbed you can see your reflection in the salt water layer while diving in the fresh water layer. At one time this cavern was not full of water, but was a cave. With time, stalactites formed on the ceiling, and then the ceiling collapsed and the cavern filled with water. Diving through these caverns is a great experience. It was as if you were exploring a cave by floating through the air. No slipping or climbing involved. Just serene floating and an occasional kick. 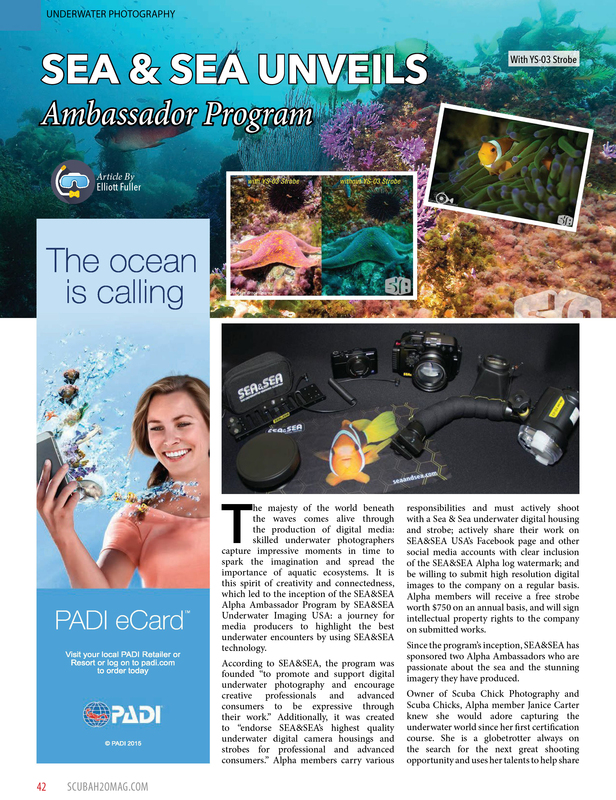 I have been involved with Sea&Sea Underwater imaging for a little while as an Alpha in their ambassador program to promote Sea&Sea Underwater housings and strobes. 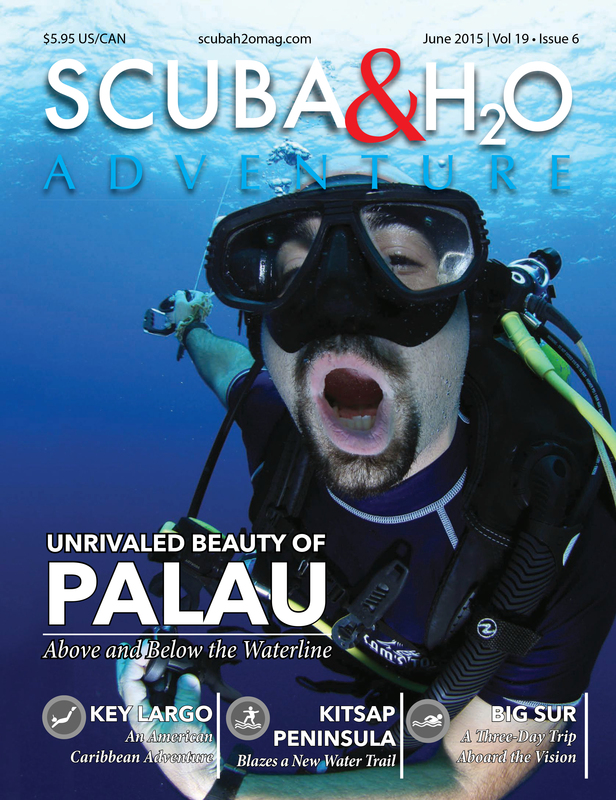 H20 Adventure Magazine has written this nice little article about the program. Currently Sea&Sea is interested in expanding the Alpha program. If you are interested in learning more about it, or becoming a Sea&Sea Alpha, this article sums up the details nicely. Beautiful blue water behind a mesmerizing subject is one of the goals that every underwater photographer strives for. It is not always easy, especially if the water you are diving in isn’t a beautiful blue! This tutorial will address a few ways you can achieve great backgrounds in-camera, while giving your images a little creative punch. 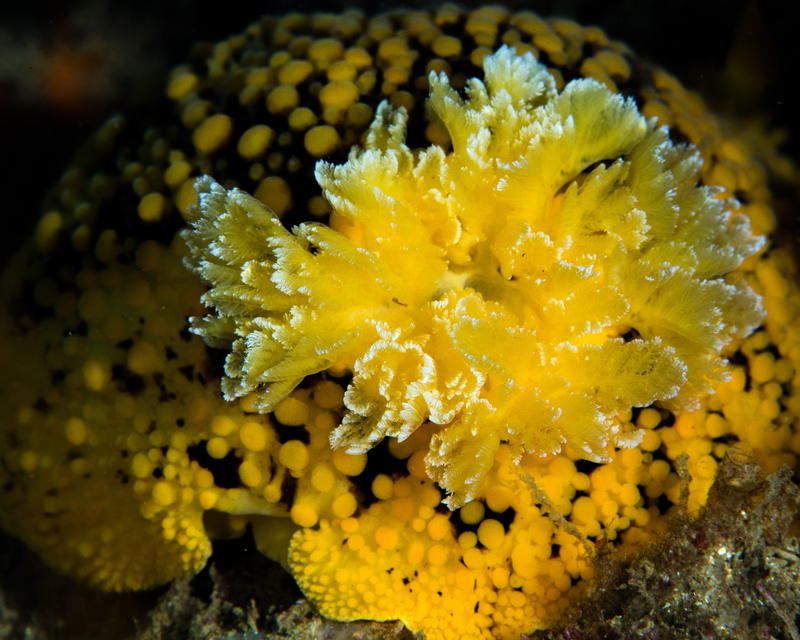 Underwater photographers shooting with a DSLR or compact camera with a manual mode, have several options when it comes to capturing the color of the water behind a subject. These options include the ISO, aperture, shutter speed, and strobe use. I always shoot in manual mode when I am under water. It allows me to control how much light reaches my sensor. In the photograph below, I used a higher ISO to boost the ambient light in the image. In this case, I had the ISO set to 500. This allowed more color and light saturation. Historically, DSLR’s have a lot of “noise” when the ISO is higher. However, the newer cameras are capable of getting a finer image with a higher ISO. 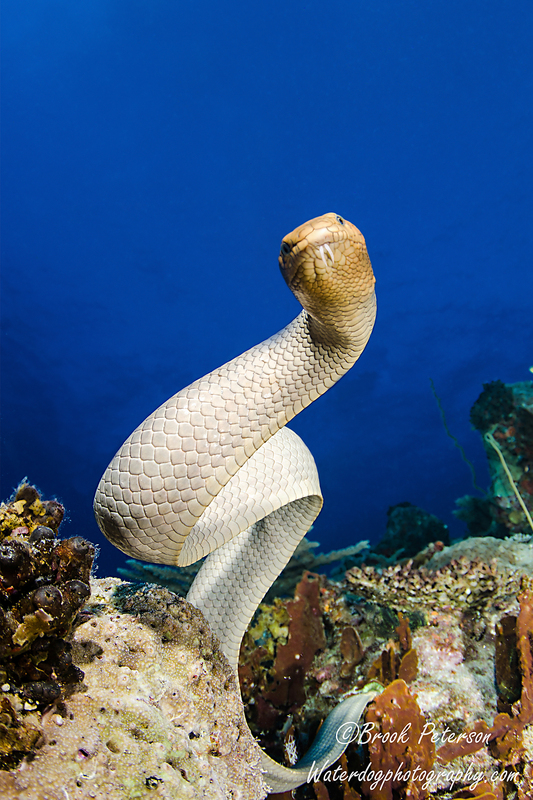 This can be a great advantage to the underwater photographer. Aperture is one of the tricky concepts when trying to control ambient light and get a bright blue background. Opening up the aperture does allow more light and may be necessary if you are using a high shutter speed. If for example, you are trying to freeze the sunbeams coming down through the water, you would want a high shutter speed to stop the light (1/250th or higher) and meter the background for aperture, so the sun isn’t too bright. This image has a shutter speed of 1/320th (the highest speed my strobes can sync with). The aperture is f/11. If you are using strobes, (and sunbeams aren’t a factor) I advise using an aperture of f/8 or above, and metering into the blue water for the shutter speed. The ISO may need to be a bit higher as well. The strobes fire at a fraction of the shutter speed and will freeze the subject so you can use shutter speeds as low as 1/13th, 1/25th, or 1/30th for close focus, wide angle shots, and macro shots. The image below has an ISO of 200, high aperture at f/18, and very slow shutter speed at 1/13th. The strobes fire at about 1/1000th of a second, so the movement of the subject is frozen because it is only lit up for a fraction of the time the shutter is open. Macro shots can be very interesting when they utilize ambient light. 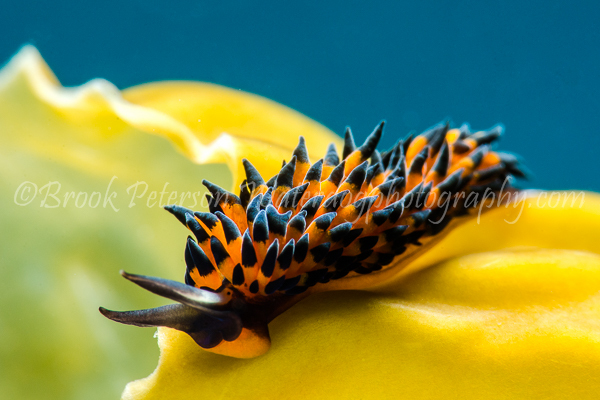 This tiny nudibranch was created using a higher ISO (400) and shooting almost directly into the sun to get enough light to expose the blue background. 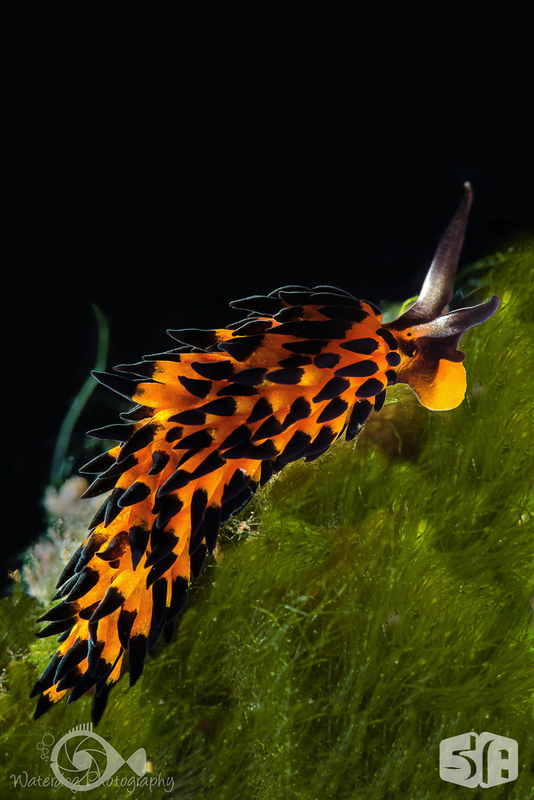 Because I wanted a sharp focus on the entire nudibranch, I stopped down the aperture to f/36, and the shutter speed was metered against the sun to 1/80th. It has been very trendy lately to get a black background behind your subject. To achieve this, you need to have nothing but water behind your subject, and a high shutter speed. 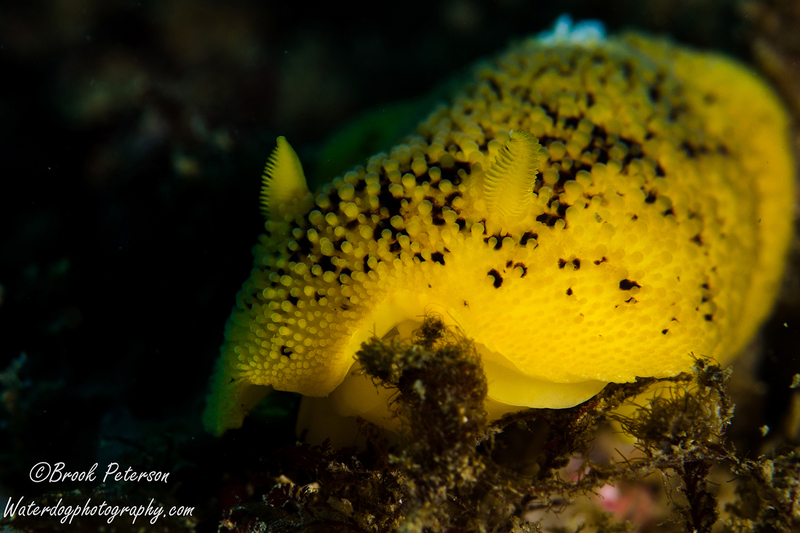 Here is the same nudibranch with drastically different settings: ISO 100, f/36, 1/320th. This lets in no ambient light. Only the strobe lights the subject. Which image do you like better? 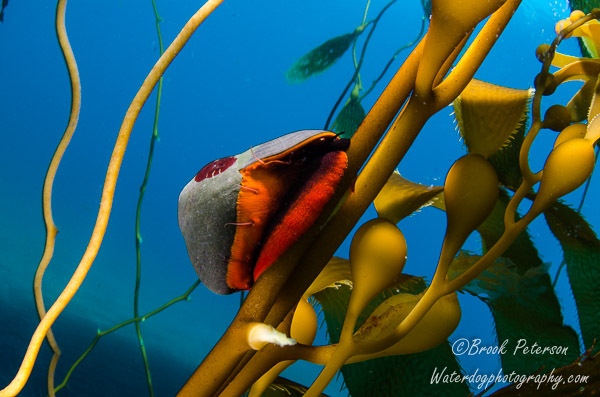 If you are new to underwater photography, you should spend some time experimenting with the aperture, shutter speed and ISO settings on your camera. Light plays such a big part in creating images, that it is arguably the most important concept to master as a photographer. As always, if you enjoy my images please visit my website, waterdogphotography.com, or give me a like on facebook at Waterdog Photography Brook Peterson. Don’t forget to follow me here atwaterdogphotographyblog! 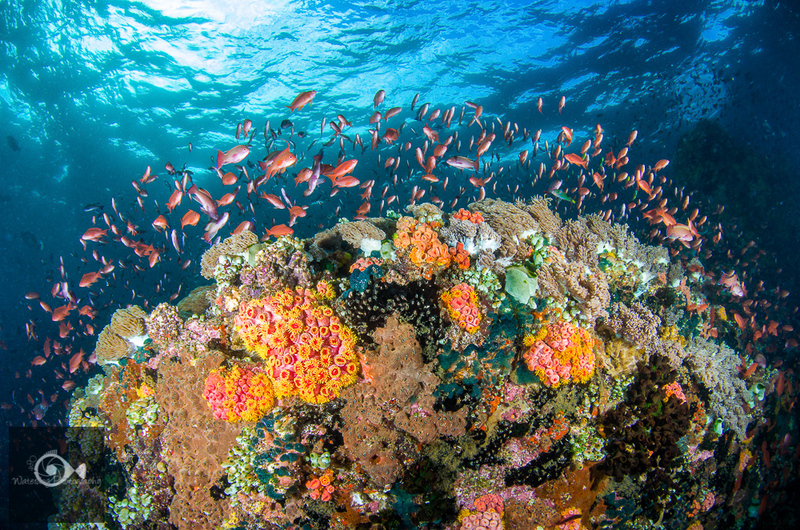 The colors of the wind, the colors of a rainbow, and the colors of the mountain have nothing on the colors of the sea! 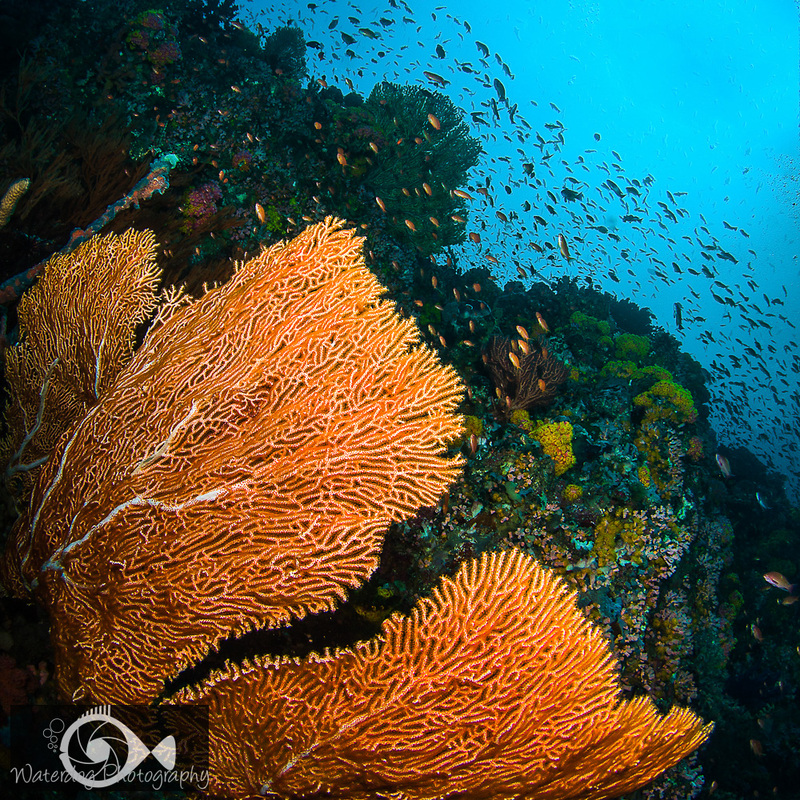 One of the most beautiful places to see beautiful underwater reefscapes is Verde Island in the Philippines. This island has an interesting history. In 1620 the Spanish galleon known as Nuestro Senora de la Vida, sunk off the shores of this island. It wasn’t until 350 years later that this ship was discovered and excavated. Now the currents have washed the remains of the ship away, but shards of blue Chinese pottery from the ship’s galley can still be found on the shores of the island. Some of the local people collect the broken dishes, vases, and tea sets and make them into jewelry, or sell the pieces to tourists. Some of these shards can even be found in paving stones in some of the local resorts. But this isn’t the reason tourists visit Verde Island. 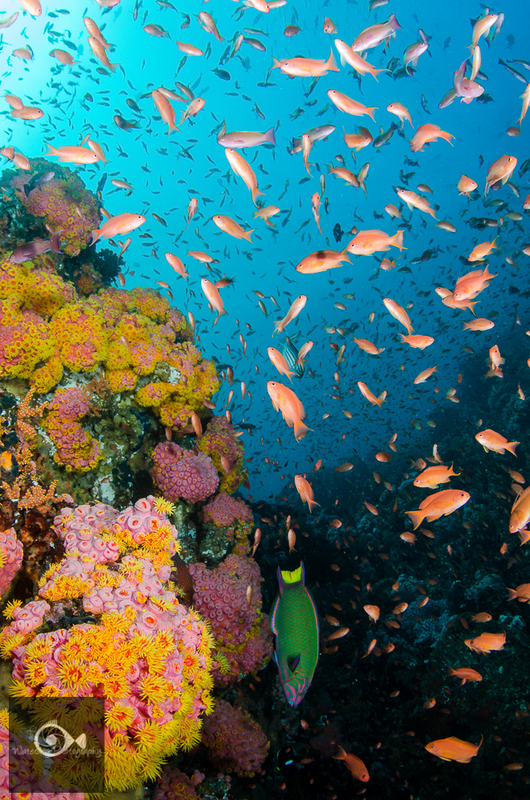 They go there to dive the very beautiful reefs that surround the island. 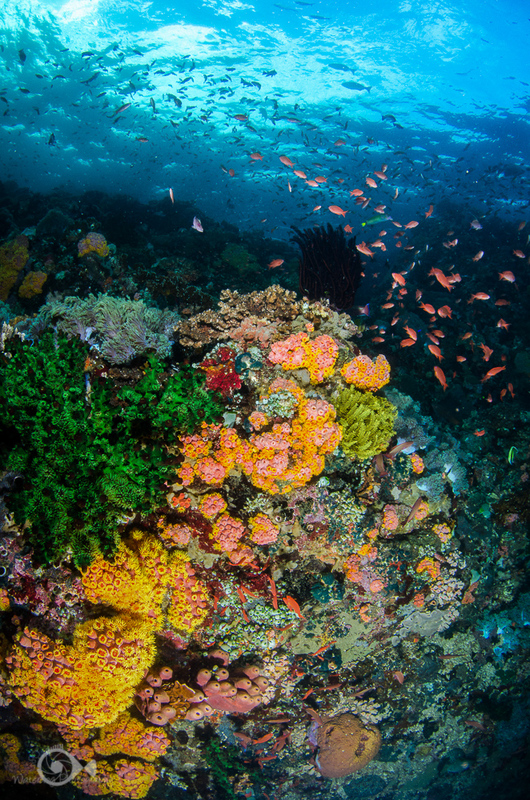 When there is a lot of current present, the corals will open up to feed and this is what makes the reefs so beautiful. In addition to the beautiful corals and anemone’s, fish abound. These beautiful pinkish fish are anthias. Here a crinoid or feather star has crawled out on the tip of the coral to catch planktonic nutrients as they pass by in the current. 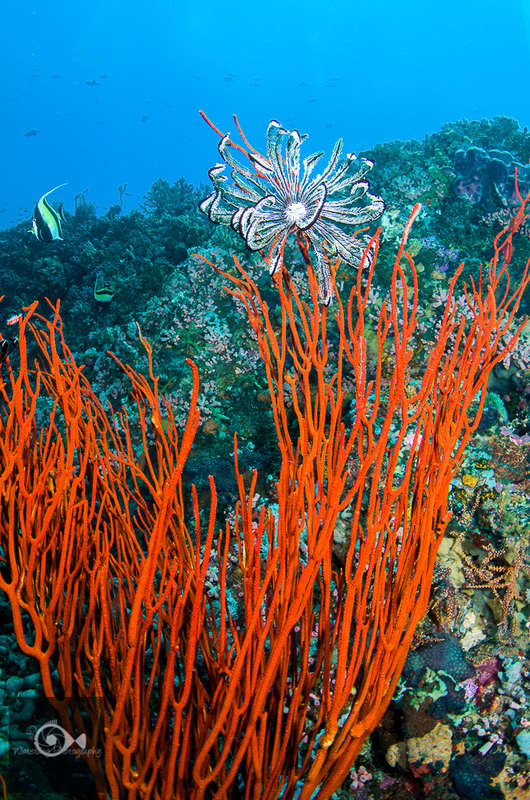 This massive sea fan is not only large, but has a beautiful color that compliments the schools of fish. 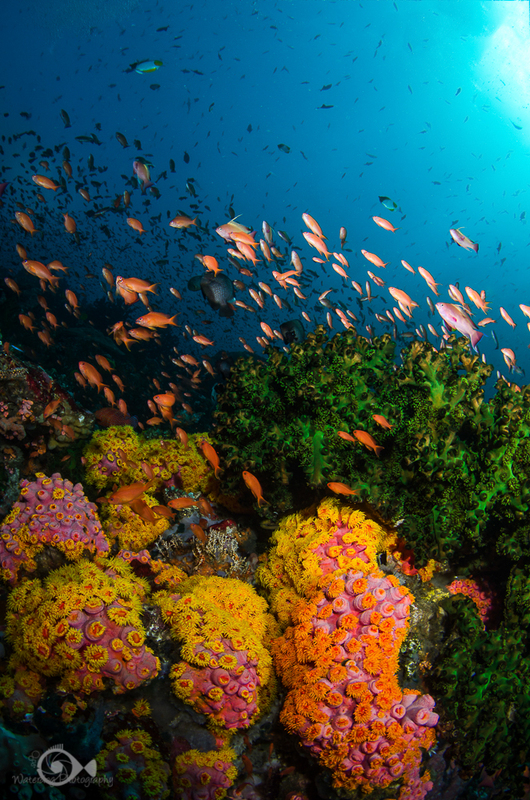 The variety of corals and anemone’s on this reef are astounding and beautiful. 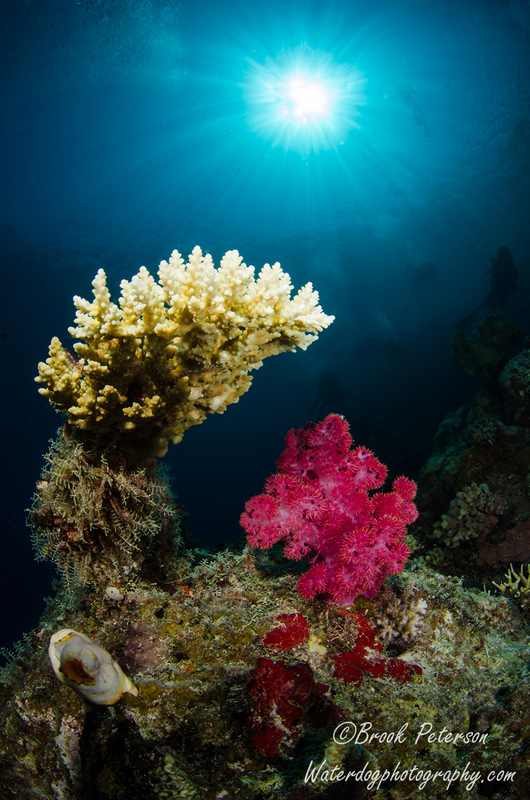 This coral head is one of my favorite images because of the diversity of life surrounding it. Focus is an important factor in any type of photography and simple minute changes to the focus can have an astounding effect on the viewer’s perspective. Sometimes it is hard to decide whether to make the majority of the image sharp or soft. Sometimes it is hard to decide just where the focus should be. This tutorial is an exploration of creative ideas that can be implemented both above and below the water line. It is in two parts. The first part will deal with what is generally thought to be important to focus on: i.e. eyes, ears, mouth, and nose. Remember that photography is subjective, so these are loose rules. 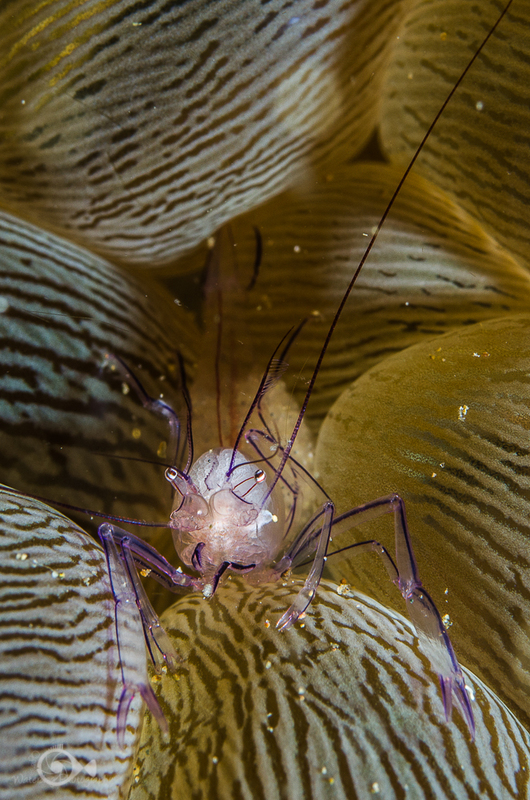 In “Underwater Photography 101: Focus, Focus, Focus! (Part 2)” you will learn how to use the camera’s aperture, light and motion to achieve more artistic focusing ideas. One of the first things we have to determine is what should be in focus. If you are photographing an animal that can look back at you, then it is essential that you have its eyes in focus, and very desirable that those eyes be looking at the camera. 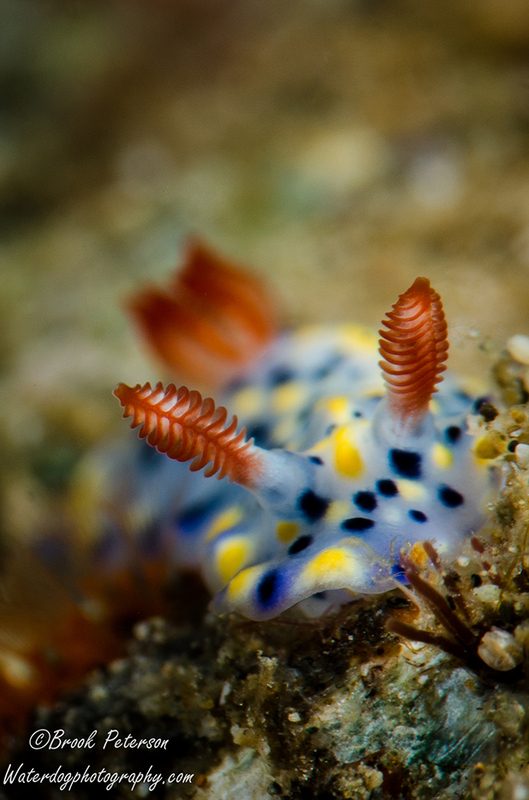 If the animal is a nudibranch, it may have “eye spots.” However, in this animal’s case, the rhinophores are the most important, and one, or preferably both, should be in focus. If the animal has an interesting feature, you may want to focus on that. 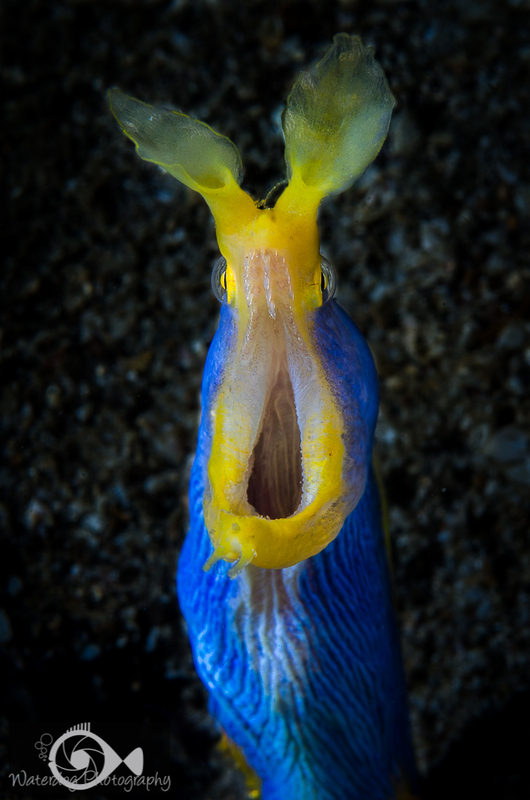 This ribbon eel has a very interesting mouth and flaring nose, so focusing on those features makes an interesting image. Don’t forget teeth! Teeth can be the most dramatic part of an image. 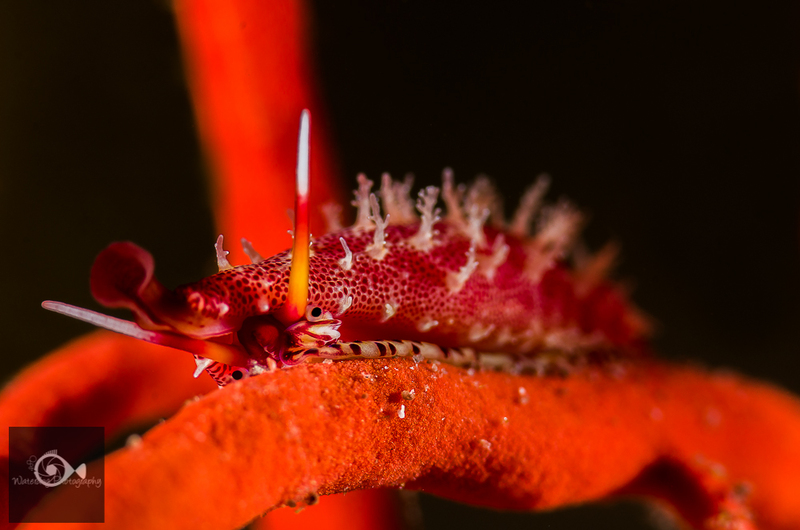 Please visit “Underwater Photography 101: Focus, Focus, Focus! Part 2” for more tips on focus! It will provide tips on using aperture, movement and lighting to achieve artistic images. 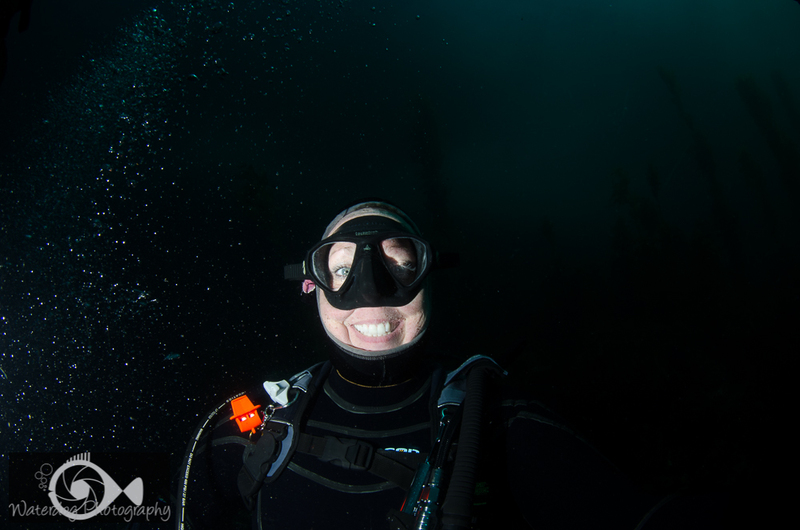 Most photographers don’t worry too much about dust particles floating in the air in front of their subjects, but in underwater photography, particles in the water is one of our main concerns. 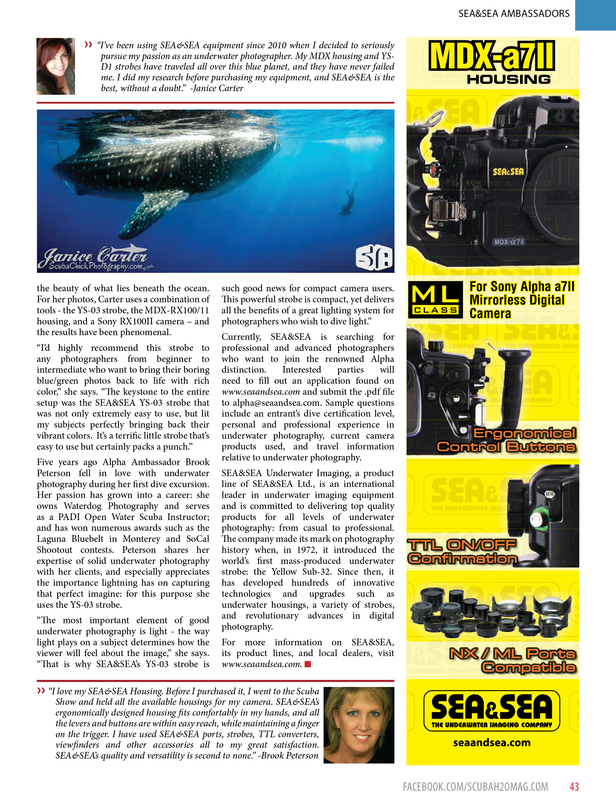 It may be difficult for both beginning and advanced underwater photographers to get an image with a clean background. By “clean,” I mean that the water around the subject is not full of little white specks. 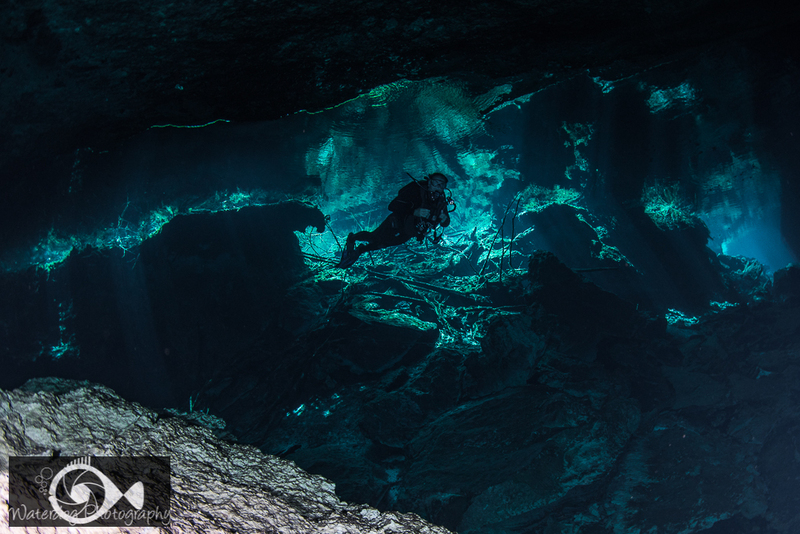 This is known as “backscatter.” Backscatter happens when particles in the water reflect the light from your strobes back towards your camera lens. If the water has a lot of particulate in it, you could get a lot of backscatter. Here are a few tips to help eliminate backscatter. Some images get a lot of backscatter because the strobes are too far forward and the beam of the strobe is directly lighting all the particles in front of your lens. It might appear as a flare on one or both sides of the image, or just look like a lot of white specks all over your image. In this selfie, the strobe on the right of the image was behind the dome port and turned out, but the one on the left of the image was a little forward of the dome port and turned toward the subject. The strobe on the left lit up all the particles in the water to the left of the subject. It is obvious that this could have been avoided if the left strobe had been pulled back further, as illustrated by the strobe on the right, which is not lighting any particles. In the following image, look at where the strobe is placed in relation to the dome port. It is pulled back so that it’s light does not go through the dome. 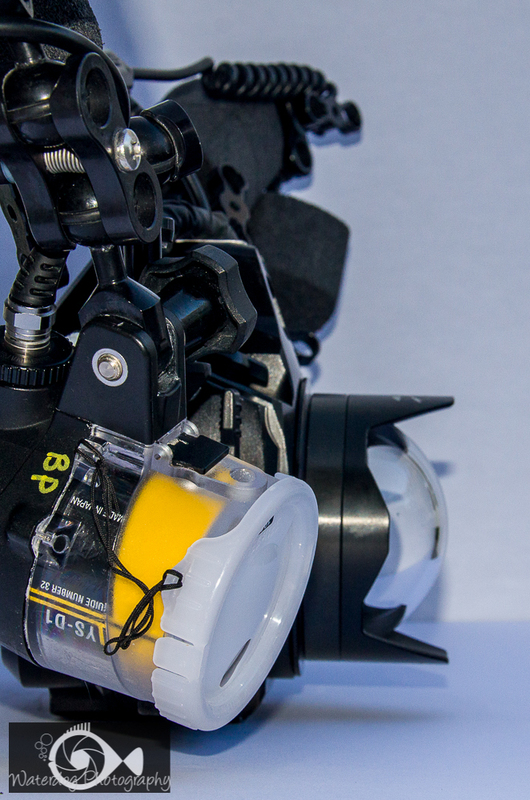 This image is meant to demonstrates how far back your strobes should be behind your dome port. The next image is a diagram of the beam angle of the strobes. (You will need to check your own strobes to see what the beam angle is, but it is usually less than 100 degrees.) Imagine that the strobes are turned out slightly, so that the angle of your beam (shown in yellow) from each strobe meets in front of your dome port. If you position your strobes so that the beam meets where your subject is, the area that is not lit should not show any particles. Ideally, you want the light from your strobes to light only the subject, and not the water in front of the subject to reduce the chances of lighting up particulate in the water. You can adjust this angle by turning your strobes further out, or by moving them out away from your housing. Sometimes, you just get a bit of backscatter no matter what you try. 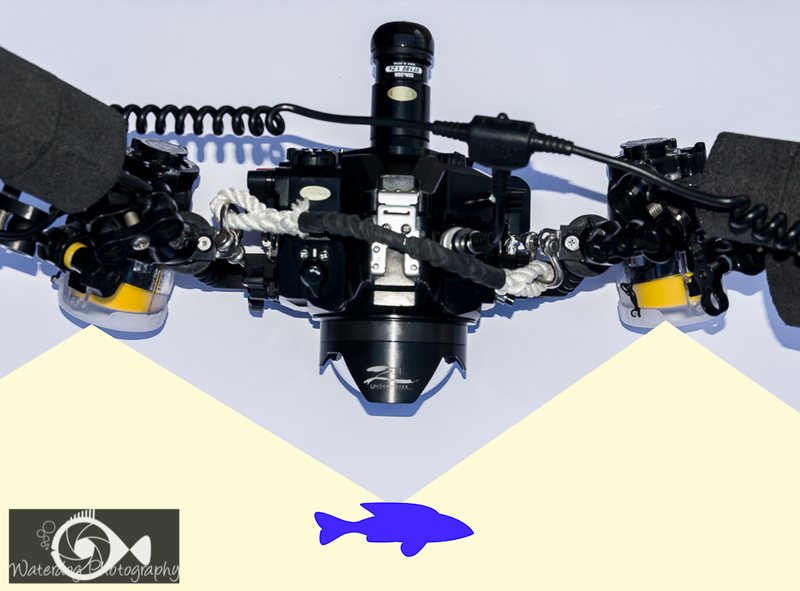 Minor backscatter can be eliminated in post-processing. There are numerous ways to remove backscatter from otherwise great images. I will show you one method I use in Adobe Lightroom CC when I have a background that is black, and a different method I use in Adobe Photoshop CC when I have blue water with backscatter in it. Just click on the title or image below to watch a “How To” video. How to remove backscatter from a black background using this great trick in Adobe Lightroom! How to remove backscatter from blue water using this great trick in Adobe Photoshop!